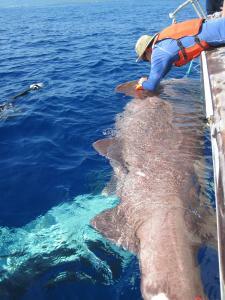 C. Meyer attaches an accelerometer to the pectoral fin of a sixgill shark. Credit: Steve Kajiura. 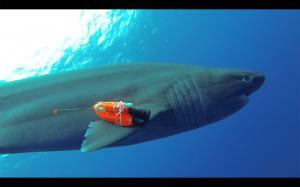 A sixgill shark equipped with an instrument package returns to deep water. Credit: Mark Royer/UH. For video footage, see the UH News story at http://www.hawaii.edu/news/2015/06/19/deep-sea-sharks-are-buoyant/. A sixgill shark equipped with an accelerometer and camera swims back down to its deep-water habitat.